Join us for some fun, laid back crafting in a great atmosphere with awesome coffee*. 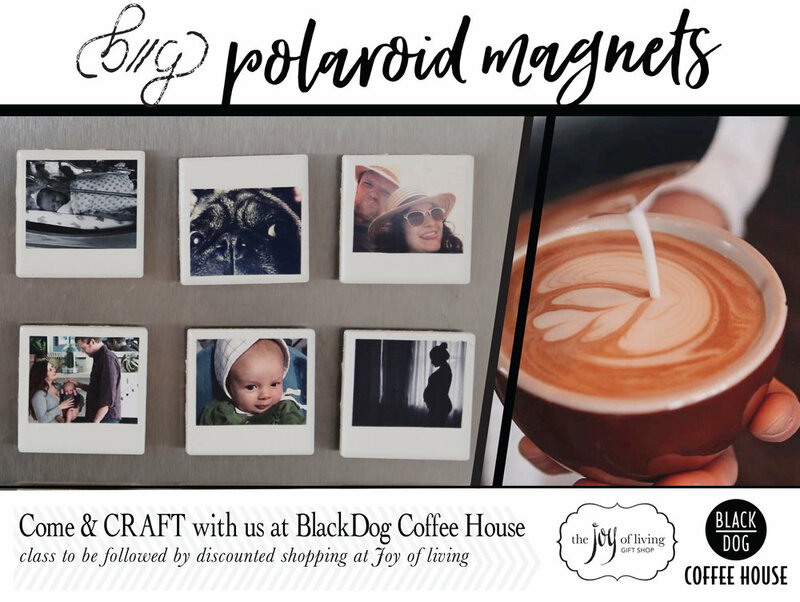 Joy of Living has invited Better to Gather to bring their crafting supplies to Black Dog Coffee House Sunday, May 6th. so that we can make Polaroid inspired fridge magnets. We have made a few of these and they are such great conversation pieces in our kitchens. These playful magnets are super strong & are made with white flooring tiles & printed images. If you want to feature your own photos please see the special instructions below. ** Otherwise you can choose from our stock photos and fun quotes with the help of an instructor from our creative Better to Gather staff! Spend the afternoon with us and enjoy some laid back making, enjoy time with friends or make some new ones, and top it all off with some special after hours shopping privileges at Joy of Living just in time for Mothers Day! ** photos must be at least 250dpi and at least 2"x2" (it's okay if they are bigger than this but not smaller.) email them in advance to laura@bettertogather.com Photo's not received by May 3rd will not be printed in time for class. If you aren't able to get them to us before this deadline you are free to print your own. The photo transfer will work best with matte paper and with photocopies of images rather then the real photos. Please do not send more then 6 photos per person. Class Registration is limited so please pre-register. Due to the limited space and supplies we may have to turn away unregistered guests. Thank you for understanding.